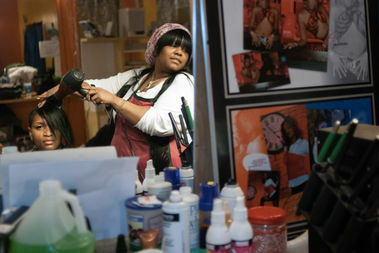 Tonika Johnson's work captures Englewood residents in their natural element. ENGLEWOOD — Seven Englewood artists have come together to form a group aiming to change the public perception of Englewood. The newly formed Englewood Arts Collective consists of a writer, mosaic artist, muralist, musician/rapper, a graphic designer and two photographers. Lewis Johnson said the group, all from Englewood, is eager to use their art and skills to change the perception of their neighborhood. The goal is to show a “true reflection.” She said they want to inform the public about the significance and importance of people within a community narrating their own story and image. The Collective's founding members include Joe Nelson, Janell Nelson, Jovanna Jackson, Glen Felix, Tanya Ward and Pugs Atomz.